Educational Qualification: Candidate should possess Computer Science/ B.E. (in IT)/ B.Tech/ M.C.A with 02 years experience in Programming for S.No.1 post, Higher Secondary (10+2) from recognized Education Council & 01 year Diploma in Data Entry Operator/ Programming, must have typing knowledge in Hindi & English languages for S.No.2 & 3 posts. Selection Process: Selection will be based on Educational Qualification, Skill test, Typing test & Experience. 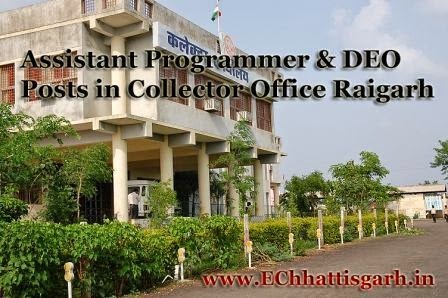 How to Apply: Eligible candidates can send their application in the prescribed format along with self attested copies of necessary certificates, mark sheets should reach to the Collector & District Election Officer (General Election) Office, Raigarh (Chhattisgarh) 30-04-2015 till 05:30 pm by Registered/ Speed post. Last Date for Receipt of Application: 30-04-2015 till 05:30 pm.